If your company experienced a major catastrophe and your phones were ringing off the hook with reporters demanding answers and information, would you know what to do? Your customers and other key stakeholders would also be waiting to see how you respond. What’s the best way to address their concerns, remain truthful and still protect your brand? When a crisis hits, you won’t have time to pontificate. You will need to know best practices and take decisive action. 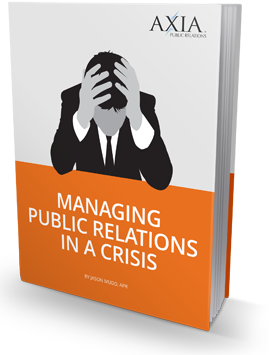 With the free Axia PR e-book Managing Public Relations in a Crisis, you can better prepare yourself to hit the ground running. Your spokesperson acts as the face of your company. Therefore, this individual must be professionally trained to handle any question or situation. The biggest job of crisis management is to prevent one from occurring in the first place. Monitoring public perception and company policies can help you head off potential problems and give you a head start on handling future troubles. Some responses can demonstrate that you are in control while others may make you look idiotic and out of touch. Learn what to say and how to say it. It’s important to take the high road and avoid a battle of words with members of the press. Being argumentative will only serve to prolong negative media coverage and further damage your company’s name. According to the Department of Commerce, almost half of the companies that face a serious crisis do not survive. Those that do manage to endure still face an uphill battle to repair their reputations and regain consumer trust. It takes a lifetime to develop a strong reputation but only minutes to ruin it. Just look at companies like BP, which is still reeling from the massive Gulf Coast oil spill five years ago. Of course, it didn’t help that the company made things even worse with insensitive comments and colossal missteps at the beginning of the crisis. If you think your company could handle such a monumental disaster alone, you may want to think again. The media can sometimes resemble a hungry animal anxious for fresh meat, and they will jump at the chance to feast on your crisis. How you respond to a crisis can be more important than the event itself. People never really expect crises to happen to their companies, but a five-minute look at today’s news will prove that they can happen to any company at any time. The question is not if your company will ever face a crisis, but when. Your best weapon is preparation. A company crisis – even a small one – can steal your focus and take away the resources you need for improving your growth and profitability. Studies have shown that every dollar spent on crisis communication planning can save you seven dollars during an actual crisis. Let the communication experts at Axia Public Relations be your trusted advisors and crisis managers. We will help you guard your reputation and get through any crisis with the right messages and positive public exposure. Download our free e-book Managing Public Relations in a Crisis or contact us today before a crisis hits your company tomorrow.